We are known as the Magic Powder Carpet Cleaner. Also the Lowest Moisture Carpet Cleaning. We can remove Coffee, Red Wine, Urine and Blood. "This is the best cleaning method I've ever seen for over 20 years! My carpets were cleaner and STAYED cleaner longer than those Chem-Dry folks. I've saved a lot of money using Poseidon". Our revolutionary Dry Compound Extraction Cleaning System is the safest and best way to clean your carpets and we've been cleaning carpets for for 20 years. This is most effective method that I’ve ever seen. It can remove red wine, blood, spots, food stains, pet urine stains and odors—and they don’t reappear. 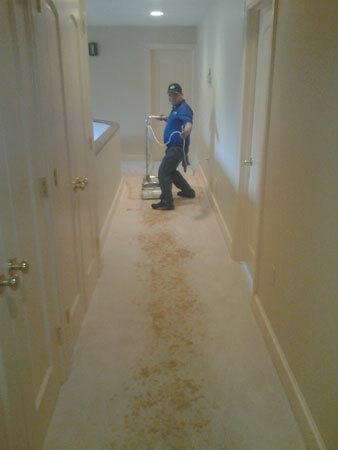 Commercial carpet cleaning is a large and important part of our business. We work with companies to help them stay within their budgets while delivering the high level of appearance any business expects. Dry extraction carpet cleaning can often improve, at a fraction of the cost, the appearance of old or very soiled carpet so that expensive replacement can be put off into another budget cycle. To show you just how good we are, we'll be happy to give you a free, no obligation demonstration on spots, stains and very heavy soiled areas. Crews can be scheduled for evenings or Saturday hours, to meet the needs of any business. We accepts cash, check or these credit cards and debit cards. Serving Montgomery County, Maryland areas: Bethesda, Chevy Chase, Gaithersburg, Germantown, Olney, Potomac, Rockville & Silver Spring, Maryland, Northern Virginia and Washington, D.C.
We specialize in residential and commercial carpet cleaning throughout the Montgomery County, MD area, Northern VA and Washington, D.C..
We are family owned and operated business located in Rockville, Maryland. 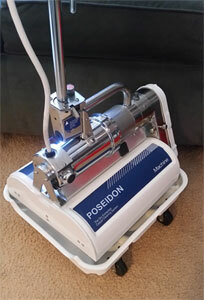 Copyright © 2008 - Poseidon Dry Carpet Cleaning- All Rights Reserved.